Muang Boran Dong Lakhon (เมืองโบราณดงละคร) was an important Dvaravati town dating back to 6th or 7th century. 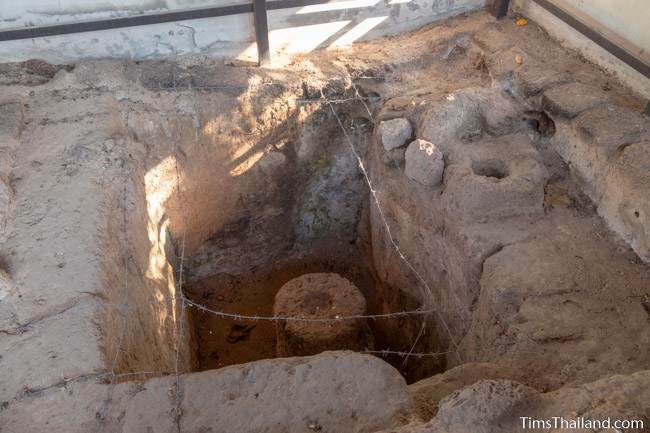 Pottery and other artefacts (including bronze bells, Baphuon- to Bayon-style Buddha images, and gold leaf, which the Khmer used during ceremonies) uncovered during excavations show that around the middle of the 10th century the Khmer came. 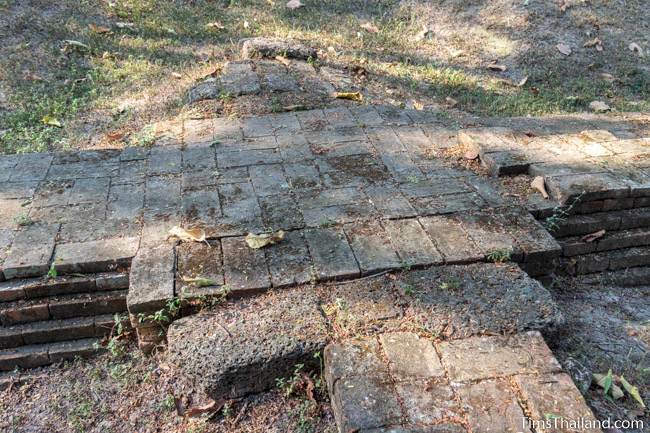 There are no remains of temples, kilns, or anything else they built, though the town probably remained principally Buddhist during the Khmer time, switching from the Dvaravati's Theravada to Mahayana. It appears to have been abandoned in the late 13th or early 14th century. 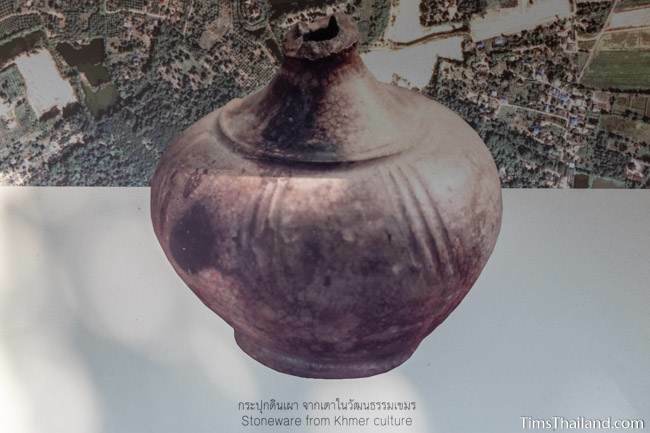 It's the only Khmer-related site found in Nakhon Nayok province. Dong Lakhon sits on a low plateau (covering about six square kilometers) rising above the surrounding rice paddies. Twin earthen ramparts with a moat between them give the city a fortified heart. This oval-shaped core is 700m wide, 800m long, and 1.8km around. The smaller outer rampart is only a meter or two tall now, and is completely gone in some places, but the 5-6m-tall inner rampart is mostly intact. Together, this triple fortification is 60m wide and quite impressive. Climbing the stairs to the top of the rampart at the north gate gives a good vantage to appreciate the true scale of things. 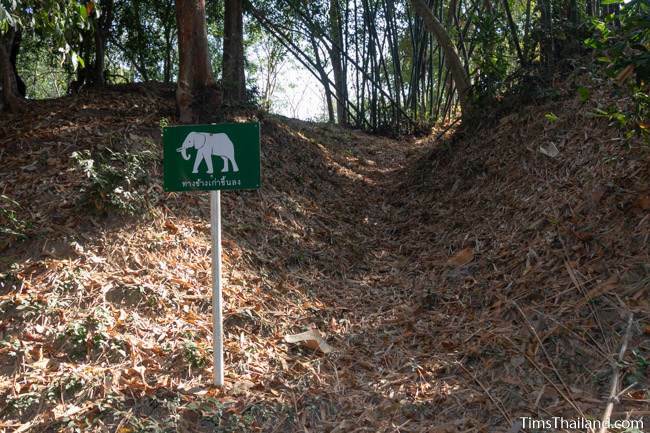 Also at the north gate is a holy well and, according to the sign, a path worn into the ground long ago by passing elephants. North of the north gate you can see a deep pond that served double duty as a laterite quarry. 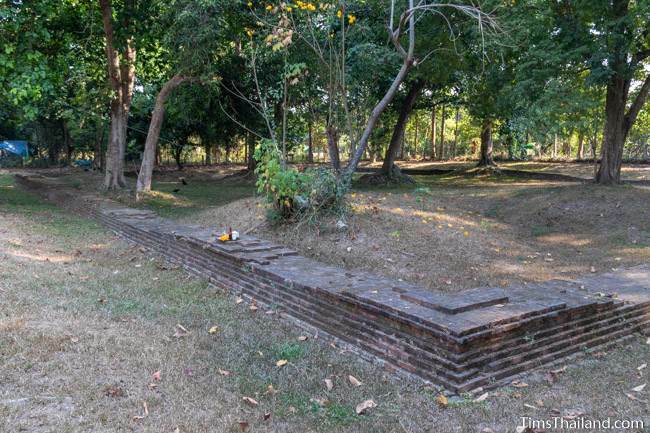 The other three gates (to the east, west, and south) also have large hand-dug ponds and these are assumed to have been dug or expanded by the Khmer. 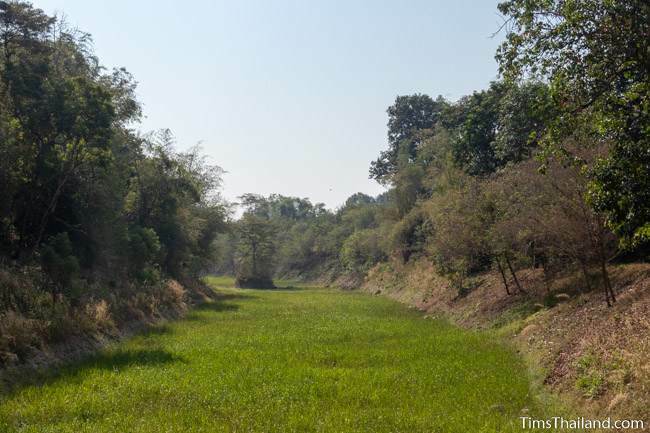 These, as well as the moat, still hold water, during and for a few months after rainy season. 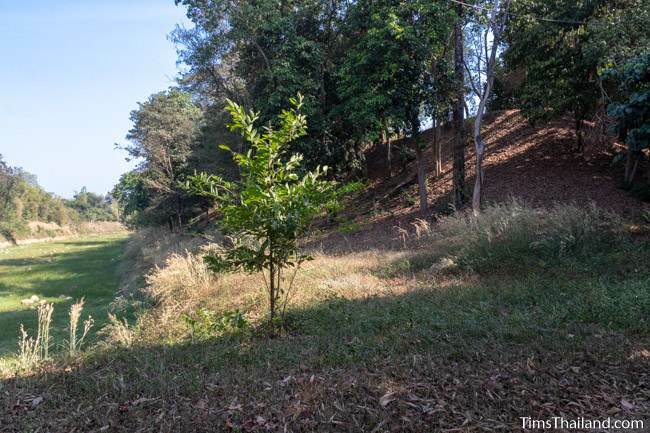 The ramparts are forested and home to many birds, making the area pleasant to explore. This is best done by bike or motorcycle since cars can't handle the small, dirt roads and walking would require a lot of time. The interior, which would have been home to the ancient elites, is now filled mostly with fruit orchards. 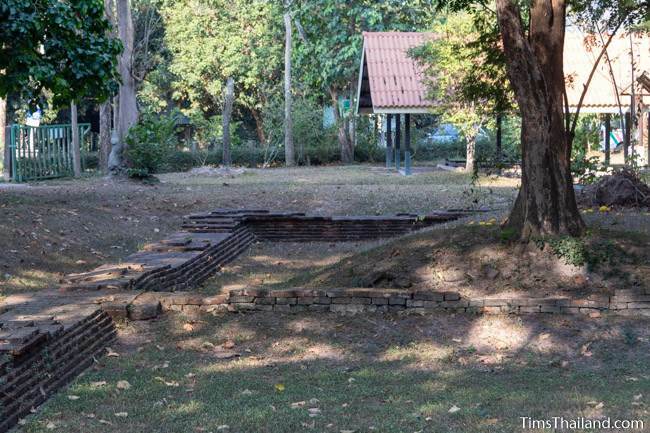 About 250 meters north of the moat are three Dvaravati-era relics A restored 32m by 43m brick foundation that locals call Ban Hin Sam Korn (บ้านหินสามก้อน), the "House of Three Stones." 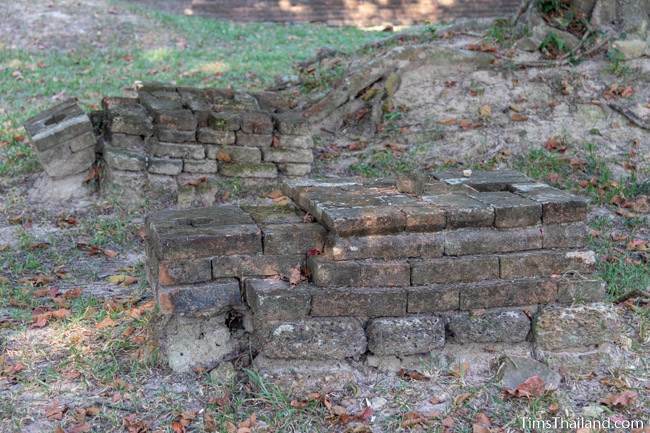 (officially it's Historical Site #1) is presumed to be from a short wall around a Buddhist temple or shrine. Two bases for statues are still there, though archaeologists suspect there were once three of them. Nearby is (or rather was) a stupa (Historical Site #2). 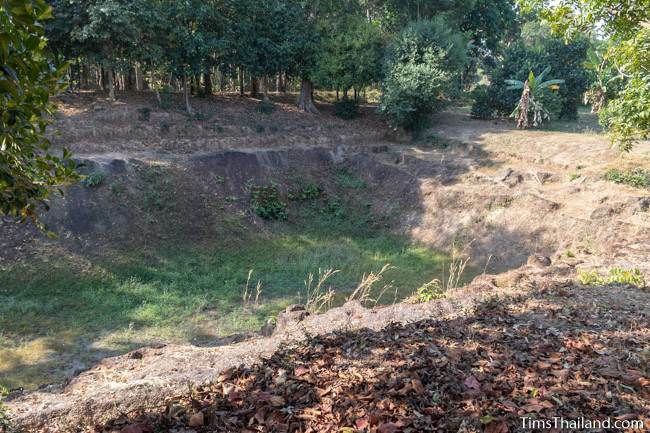 None of the superstructure remains, but some of the laterite base is still there and buried below it is a two-layered hollow round stone carving, probably an urn though perhaps a foundation stone. Many artifacts were recovered from the ground here including many small clay Buddhas; bronze rings, bracelets, and earrings, stone and crystal beads (about 2000 of them); and stone stamps with crab and elephant designs. So it seems to have been built either for a temple's opening dedication ceremony or to honor an important person. 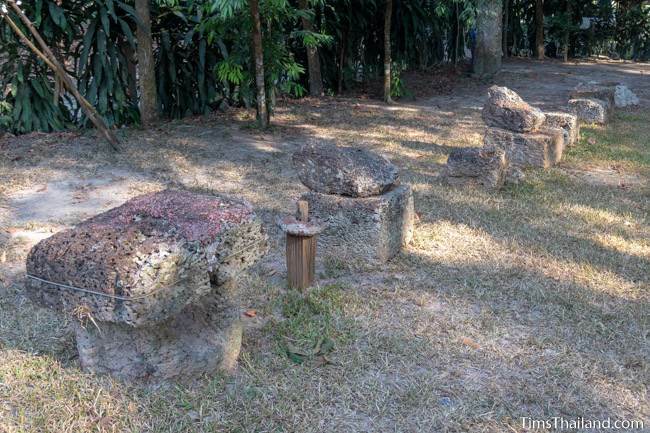 Next to the western doorway is a row of what are believed to be small stupas made of laterite for holding funerary ashes. These were brought from other spots to display here. A set of illustrated historical signs provide some historical background on Muang Boran Dong Lakhon in English and Thai. This section is officially open 8am-6pm. Several excavations were done around the ancient city between 1972 and 2013 and besides the artifacts already mentioned some of what was found includes a gold-plated Buddha head, carnelian and agate beads, Dvaravati coins, and pottery from both China and Persia. 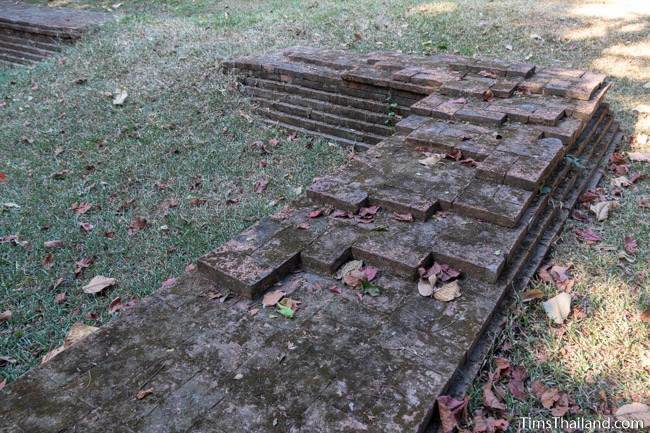 Some of these can be seen in the Prachinburi National Museum while others, if local officials get their way, will be put on display at a future on-site museum. The director of the Nakhon Nayok Provincial Cultural Office, who happened to be at the site when I visited, said he would like to see it open in 2020. I have no clue on the likelihood of this happening then, or ever, but locals are very proud of the site which always helps get projects funded and completed. The source of the name Dong Lakhon, which, with a little poetic license, means "Forest of the Mysterious Musical Sound," is unknown, though two stories are told. One is a folktale that people heard music on full moon nights coming from the ancient city and gave it the name. The other is that it was once called Dong Nakhon, "Abandoned City," and over time the "N" was distorted to an "L."